1. Leaves should never be raked, put in bags and sent to the landfill. 2. Leaves should never be raked, put into piles and set on fire. 3. Leaves should never be raked and put into the compost pile - except as a last resort. 4. 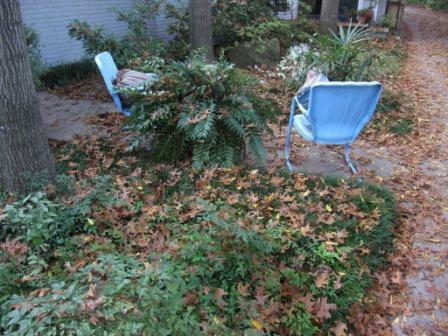 Leaves should never be blown on to the neighbor’s property like the people next door do. 1. Mow the leaves and mulch them into the turf. Using a mulching mower is best but not essential. Turf can take quite a volume of leaves before there is excess. Excess would be when the lawn is about to be completely smothered by the ground-up leaves. 2. At the point of excess, the leaves should still be mulched on the lawn or driveway but raked, picked up and distributed as mulch in flower beds and vegetables gardens. 3. When no more mulch is needed in the flower and vegetable beds, the remaining leaves that have been ground-up by the lawnmower can be put into the compost pile. Add dry molasses to the beds and the compost pile to help the material break down and become humus more efficiently. Use it at about 20 lbs. 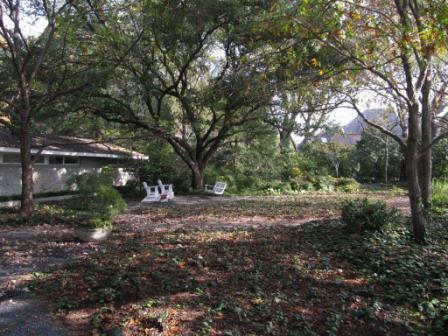 per 1000 sq ft. Never under any circumstances should the leaves be removed from the site. They should either be mulched or composted. All cities should outlaw the city service of picking up grass clippings. If home and business owners have to recycle the organic matter, the landscapes are healthier; water runoff is reduced, and less tax money has to allocated to picking up and managing leaves and other organic matter. Everybody wins! This holiday season introduce the organic lifestyle by giving Organic Gift Packages. on ALL purchases in the Natural Organic Shop. A portion of membership supports the Texas Organic Research Center.